Facet5 is one of the most advanced measures of personality available today. It provides a model and measure of personality that explains how and why people differ in their behaviour, motivation and attitudes. Understanding one’s own Facet5 profile can make a huge difference to how well we communicate and how effectively we work with others. Facet5 is based on the five factor model of personality, or ‘Big Five’, which is now widely accepted as the best way of describing the fundamental building blocks of personality¹. We all have elements of the Big Five, how much we possess shapes our personality and many of our preferences. Facet5 measures these factors using a self-assessment questionnaire to provide an accurate and detailed picture of individual differences in personality and behaviour. Download an example report here. Facet5 is used to support many aspects of personal and professional development. It has a role to play in recruitment, talent management, leadership development, personal development and team working. A qualitative assessment of the candidate in each of these areas is provided in the report (‘Searchlight Review’ section) based on their Facet5 Scores. This works on the basis that an individual’s personality is predictive of their natural strengths in work-related competencies. Potential strengths and development areas based on a personality profile can be explored in depth during an interview. Facet5 is particularly useful for individuals from different countries and cultural backgrounds, as unlike other personality tests (e.g. Myers-Briggs Type Indicator), the five-dimensional structure is proven to be robust across all major regions of the world². Individual reports are generated using an online questionnaire which includes questions about attitudes, behaviours and preferences (often in a work context). Scores are plotted against a large sample population (18,500 people) which allows the user to see how they compare to others. Individual scores range from 1 to 10, where 5.5 is the average. Scores above 7 or below 4 are considered to be ‘extreme’ – highlighting strong or striking characteristics of the user. Each of the main Facets is sub-divided into a series of sub-scales: Energy, for example, is sub-divided into Vitality, Sociability and Adaptability. 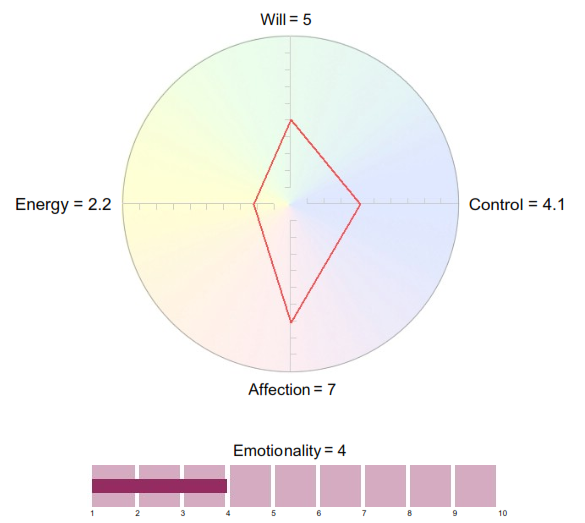 Emotionality is plotted separately from the other Facets as it has an impact on each of the others elements. For example, people with low Emotionality tend to be consistent and predictable (what you see today is what you’re likely to see tomorrow). In contrast, people with high emotionality show less consistency in how personality qualities are expressed and there is a tendency for negative traits to become more prominent. Post Office Ltd manages a nationwide network of over 17,000 Post Office branches, and is the largest Post Office network in Europe and the largest retail branch network in the UK. It handles more cash than any other business. The Chief Executive Officer had previously been using many traditional psychometric tests such as the Myers Briggs, and wanted a more modern and up to date tool for his team. Facet5 was completed by the eight top executive directors online, and they had agreed to share information from the outset. Following completion, a group feedback afternoon was arranged to evaluate and compare the team using Facet5 profiles and TeamScape (a module of Facet5 that shows where conflict and agreement can arise within a team). Facet5 helped by giving the team a better understanding and awareness of each other’s strengths, with better collaboration and appreciation of other team members and how they worked. Feedback helped the team to work cohesively together to understand the strengths and weaknesses of individuals. The executive directors felt that on a personal level Facet5 was reflective of their personality and were impressed by the accuracy and clarity of the tool. Since that time they have been using Facet5 to recruit, and are using TeamScape to analyse their own chief teams. Audition is a report generated from Facet5 data that is designed to help organisations find the right candidate for specific roles (e.g. a sales person). To learn more about Audition click here. ¹Digman, J M (1990). Personality structure: Emergence of the five factor model. Annual Review of Psychology, 41, 417-440. ²Schmitt et al. (2007). ‘The Geographic Distribution of Big Five Personality Traits. Journal of Cross-Cultural Psychology, Vol. 38 No. 2, March 2007 173-212.